NEW LISTING! 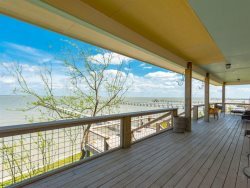 Happy Harbor is a new construction home in Copano Ridge with beautiful canal views and access to lots of fun. This home is a dog friendly home with a spacious backyard, picnic tables, BBQ grill, and 6 foot fishing dock. This is a great area for fishing and the dock has a timed underwater green light. Happy Harbor sleeps up to 10 people and is perfect for a family vacation or getaway with your friends. You can leave the stresses of parking behind as there is a garage and a huge driveway. The living room is colorful and coastal with TVs and wifi. The living room opens up into the kitchen area which is partly closed off by a marble bar. All appliances are brand new including the stainless steal refrigerator, microwave, and oven. Grill up some fish you caught and gather with your family or friends at the large dining room table. This two story house has four spacious bedrooms and three bathrooms. You will never leave the beach with the ocean colored master bedroom and its king sized bed, hard wood floors, TV, and connecting bathroom. The bathroom has a walk in shower as well as a huge tub. There is also a second downstairs bathroom with a walk in shower. The second bedroom has a queen size bed with a TV, and the third bedroom has a king sized bed. Both bedrooms are upstairs. The fourth bedroom is upstairs and the perfect kids room with four brightly colored twin sized beds that they will be sure to love. The last bathroom is upstairs with walk in showers and coastal themed décor. Copano Ridge is a beautiful area that has Salt Lake and canals on one side and Copano Bay on the other. Only a few minutes from downtown Rockport, this area is convenient while still being private enough to relax. There is lots to do in Rockport including shopping downtown at Market Street, fishing from your backyard, spending a day at the Rockport Beach, enjoying fresh seafood by the water, or checking out local historical sites. You don’t have to worry about picking only one thing to do on your trip because all of these activities are only a short drive from each other. Rockport is kid friendly, pet friendly, and friend friendly! No matter what type of vacation you envision, Rockport is the place for you. We had a great time and we're more than satisfied with the rental!